This easy Mini Tomato Tarts Tatin recipe is the perfect appetizer or finger food to impress your guests with! Tomatoes are sautéed with garlic, topped with salty feta and fresh thyme, and all covered in a flakey pie dough and baked in a muffin tin until golden crisp, softened and caramelized when flipped. 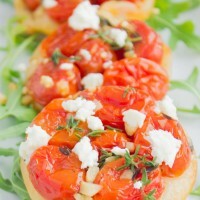 I also love this recipe for Mini Tomato Tartes Tatin, because it reminds me of my mom. Probably because she has a passion for French cuisine, also because she loves tarts! And she absolutely loves everything in mini size! It was her who taught me the most about food. It certainly had to look gorgeous and sophisticated, not just delicious. Another thing she taught me is that food looks better in mini sizes. Hence, this mini version of the French Classic Tarte Tatin. So rather than a large tart, we’re making them bite-sized. Now that doesn’t mean making food more complicated, it actually means making it simpler and faster. This recipe for Mini Tomato Tartes Tatin is one of those recipes I love making at my cooking classes. It’s a shamefully simple and easy technique yet you get showstopping results when flipping your Mini Tomato Tartes Tatin and revealing the caramelized tomatoes. 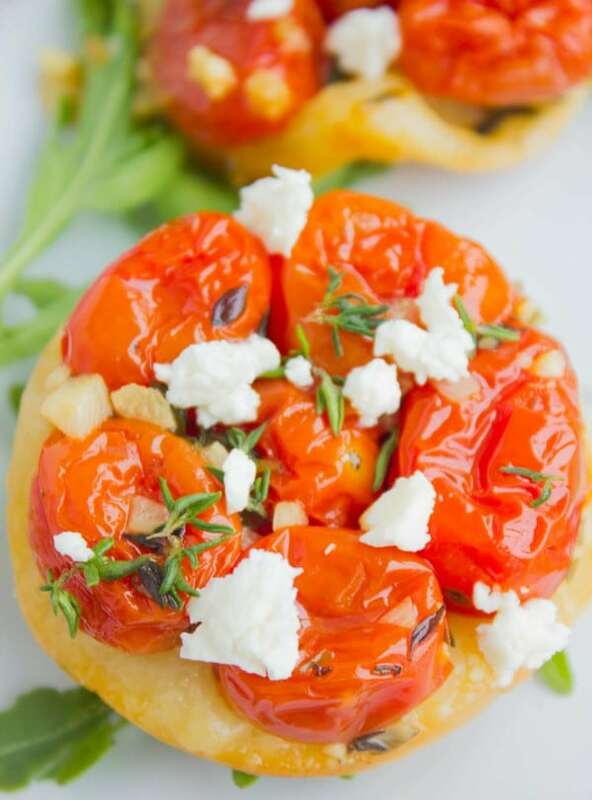 When it comes to these Mini Tomato Tartes Tatin, imagine biting into a beautifully ripe and sweet roasted tomato that has a hint of garlic and fresh thyme, and a tang from the feta followed by an ever so delicate pastry crunch. 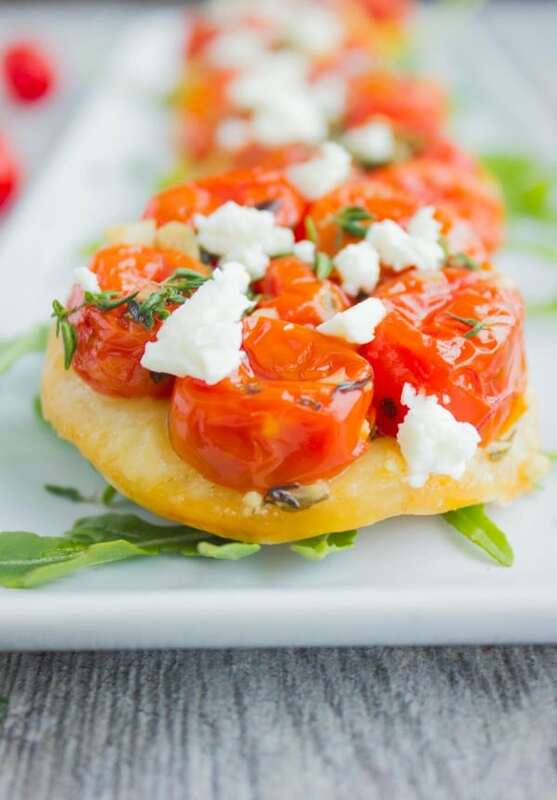 Crumbled feta cheese adds a complimenting salty and tangy taste to the Mini Tomato Tartes Tatin, and above all, the feta cheese gets the tomatoes to stick to the pastry. My easy Tomato Tarte Tatin is perfect for entertaining, for fancy potlucks, or when you’re making a special dinner for a special someone! Almost too good to be true! Especially now when tomatoes are in season! 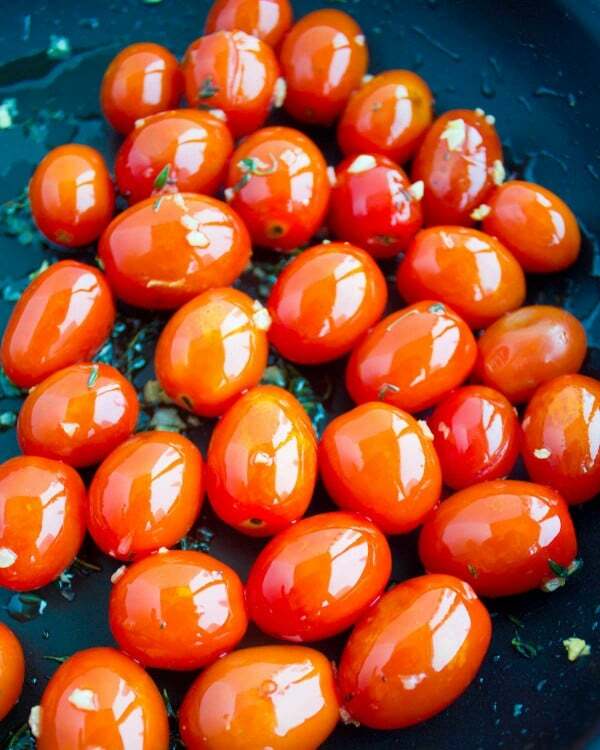 Preheat the oven to 400 degrees F. Sautee the garlic in olive oil over medium-high heat for just a minute until it’s fragrant, then add in the cocktail tomatoes and thyme and sauté for 30 seconds more. Take a standard size muffin pan and place about 4-5 tomatoes at the bottom of each mold and arrange them so they don’t overlap. Sprinkle about 1/2 teaspoon of feta cheese on top of the tomatoes and make sure the cheese doesn’t sink to the bottom of the muffin pan as it may burn during baking. Roll out the pastry dough into 1/8th thickness and use a round cookie cutter of about 1 1/2 inch in diameter to cut out circles of dough. Take one of the rounds and press it firmly on top of the tomatoes and feta. Brush the tops of the pie dough with the egg wash and sprinkle with some fresh thyme. Bake the Mini Tomato Tartes Tatin for 15-18 minutes until the pie crust is golden. 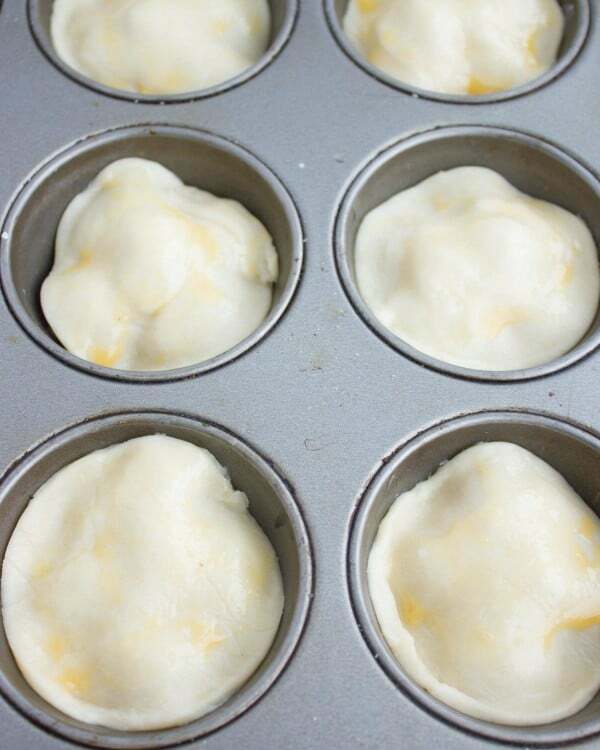 Remove the muffin pan from the oven and wait 2 minutes for the Mini Tartes Tatin to cool down. Use a small spatula, plastic knife or spoon and gently lift the mini tarts out of each mold and flip them upside down on a plate. Serve you Mini Tomato Tartes Tatin immediately. I’ve posted my recipe for easy flakey pie dough before, and I can’t stress how simple it is. However, I will admit that store-bought puff pastry works just as fine with these Mini Tomato Tarts Tatin. And it makes them do-able in 20 minutes from start to finish! 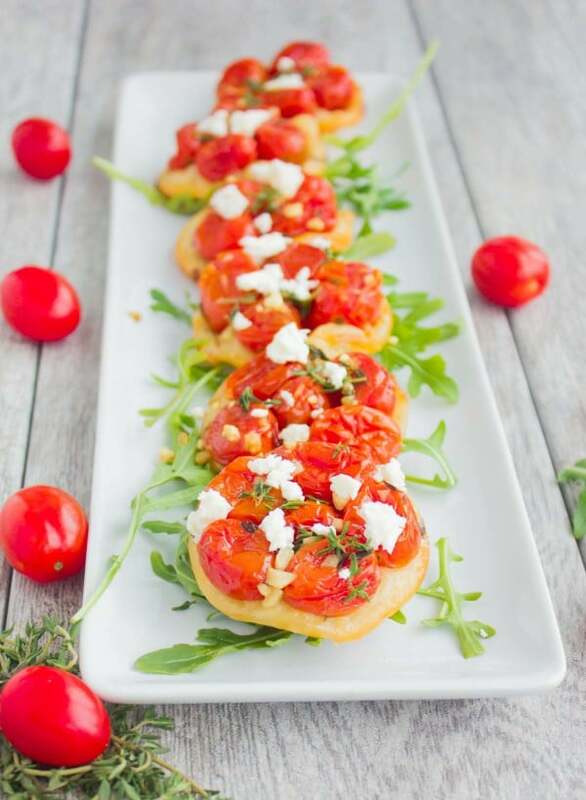 These Mini Tomato Tartes Tatin are perfect for your next brunch, or finger food party. They make a great appetizer or side dish at your table. And a potluck superstar! Give those gorgeous, delicious and super easy Mini Tomato Tartes Tatin a try and take your appetizer game to the next level! Don’t like feta cheese? 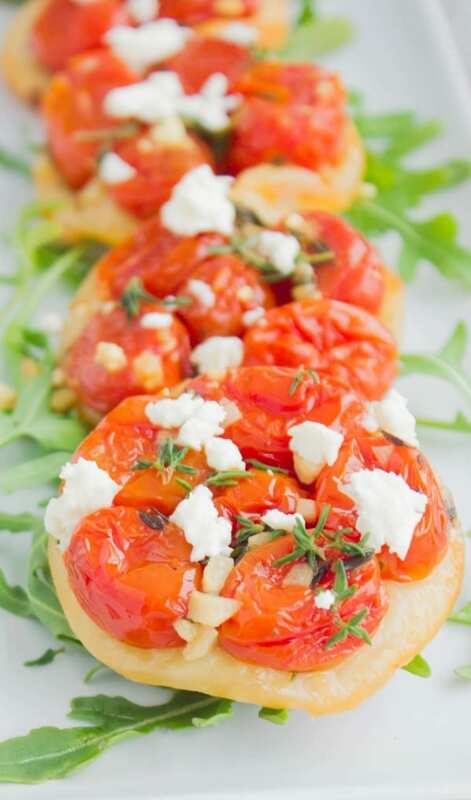 Goat cheese or Parmesan cheese is just as yummy in this tomato tartes recipe! When sprinkling your cheese on top of the tomato tartes, make sure the cheese doesn’t sink to the bottom of the muffin pan as it may burn during baking. For a quick shortcut, use store-bought pie dough or puff pastry. Otherwise, use my pie dough recipe. This easy Mini Tomato Tarte Tatin recipe is the perfect appetizer or finger food to impress your guests with! Tomatoes are sautéed with garlic, topped with salty feta and fresh thyme, and all covered in a flaky pie dough and baked in a muffin tin until golden crisp - when flipped, the tomatoes will be slightly softened and sweet from roasting. Roll out the dough into 1/8th thickness and use a round cookie cutter about 1 1/2 inch in diameter to cut out circles of dough. 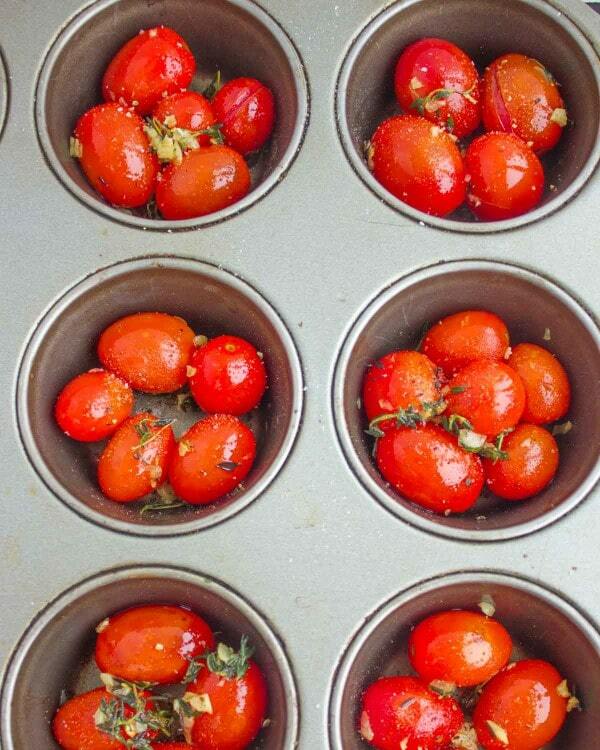 On a standard size muffin pan, place about 4-5 pieces of tomatoes at the bottom of each cavity and arrange them so they don't overlap. 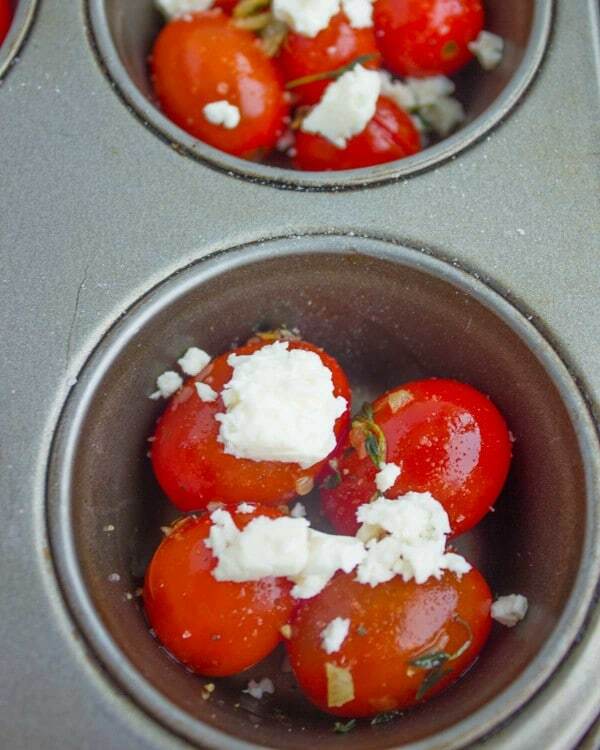 Sprinkle about 1/2 teaspoon of feta cheese on top of the tomatoes and make sure the cheese doesn't sink to the bottom of the muffin pan as it may burn during baking. Take a circle of the dough and press it firmly on top of the tomatoes and feta. Brush the tops of the pie dough with the egg wash and sprinkle extra fresh thyme. Bake for 15-18 minutes until the pie crust is golden. Remove the muffin pan from the oven and wait 2 minutes for them to cool down. 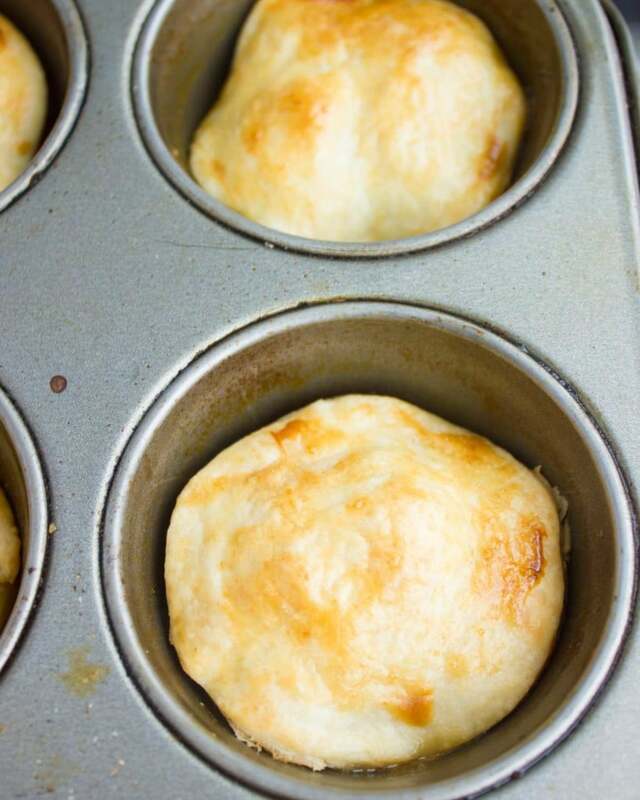 Use a small spatula, plastic knife or spoon and gently lift the tarts out of each muffin cavity and flip them upside down on a plate. Serve. There is nothing better than farm fresh tomatoes! This looks delicious! Another yummy recipe for me to make once the growing season starts! Thanks Mahy! Can this recipe be made as a full sized tart?